LARRY KOOPA Cartoon vinyl decal from Super Mario Bros. Sticker for almost anything! This is a LARRY KOOPA from Super Mario Bros. vinyl decal sticker. WENDY KOOPA Cartoon vinyl decal from Super Mario Bros. Sticker for almost anything! ROY KOOPA Cartoon vinyl decal from Super Mario Bros. Sticker for almost anything! LEMMY KOOPA Cartoon vinyl decal from Super Mario Bros. Sticker for almost anything! 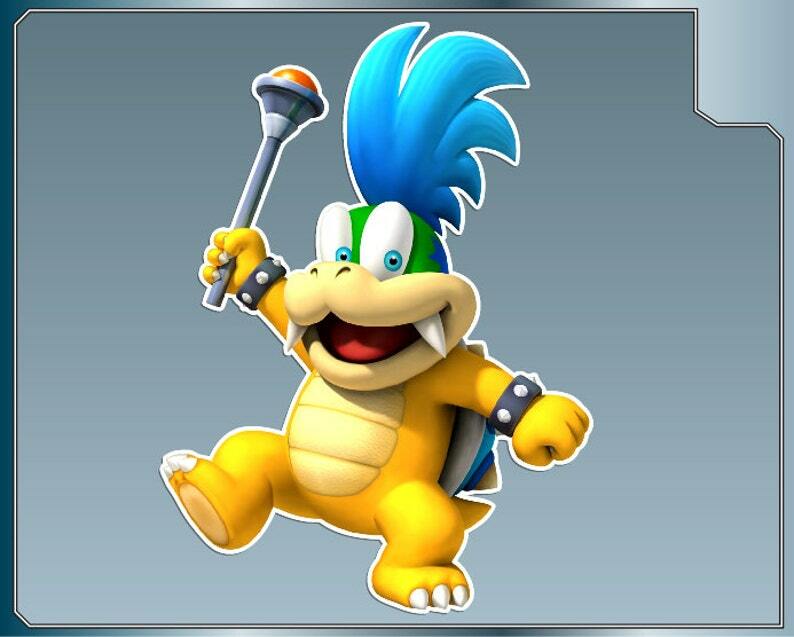 BOWSER JR. Cartoon vinyl decal from Super Mario Bros. Sticker for almost anything! LUDWIG VON KOOPA Cartoon vinyl decal from Super Mario Bros. Sticker for almost anything! My son was very happy with his decal. He put it on his wall right away. TANOOKI MARIO Cartoon vinyl decal from Super Mario Bros. 3 Sticker for almost anything! RACCOON MARIO vinyl decal from Super Mario Bros. 3 Sticker for almost anything! Green KOOPA TROOPA No. 3 vinyl decal from Super Mario Bros. 3 Sticker for almost anything! Green KOOPA TROOPA No. 1 vinyl decal from Super Mario Bros. Sticker for almost anything! FROG MARIO Sprite vinyl decal from Super Mario Bros. 3 Sticker for almost anything!